Get Saturday and Sunday hire for FREE! 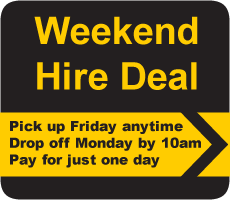 Regardless of what tools you need, we can give you one of the best weekend hire deals around – 3 days hire for the price of one on any product from our range. So if you have a job which needs done, you can rest assured that your hire costs can be kept to a minimum when you’re making those deadlines.